This article is about the trademarked book series. For the genre, see Gamebook. For the TV series, see Lawrence Leung's Choose Your Own Adventure. Not to be confused with You Decide on the Adventure. Choose Your Own Adventure is a series of children's gamebooks where each story is written from a second-person point of view, with the reader assuming the role of the protagonist and making choices that determine the main character's actions and the plot's outcome. The series was based upon a concept created by Edward Packard and originally published by Constance Cappel's and R. A. Montgomery's Vermont Crossroads Press as the "Adventures of You" series, starting with Packard's Sugarcane Island in 1976. Choose Your Own Adventure, as published by Bantam Books, was one of the most popular children's series during the 1980s and 1990s, selling more than 250 million copies between 1979 and 1998. When Bantam, now owned by Random House, allowed the Choose Your Own Adventure trademark to lapse, the series was relaunched by Chooseco, which now owns the trademark. Chooseco does not reissue titles by Packard, who has started his own imprint, U-Ventures. On January 11, 2019 Chooseco initiated a trademark infringement legal challenge against Netflix for the film Black Mirror: Bandersnatch. Originally created for 7- to 14-year-olds, the books are written in the second person. The protagonist—that is, the reader—takes on a role relevant to the adventure, such as a private investigator, mountain climber, race car driver, doctor, or spy. Stories are generally gender- and race-neutral, though in some cases, particularly in illustrations, there is the presumption of a male reader (the target demographic group). In some stories, the protagonist is implied to be a child, whereas in other stories, they are an adult. The stories are formatted so that, after a couple of pages of reading, the protagonist faces two or three options, each of which leads to more options, and then to one of many endings. The number of endings is not set, and varies from as many as 44 in the early titles, to as few as 8 in later adventures. Likewise, there is no clear pattern among the various titles regarding the number of pages per ending, the ratio of good to bad endings, or the reader's progression backwards and forwards through the pages of the book. This allows for a realistic sense of unpredictability, and leads to the possibility of repeat readings, which is one of the distinguishing features of the books. As the series progressed, both Packard and Montgomery experimented with the gamebook format, sometimes introducing unexpected twists such as endless page loops or trick endings. Examples include the "paradise planet" ending in Inside UFO 54-40, which can only be reached by cheating or turning to the wrong page by accident, and the potentially endless storyline in The Race Forever. According to Packard, the core idea for the series emerged from bedtime stories that he told to his daughters, revolving around a character named Pete and his adventures. Packard stated, "I had a character named Pete and I usually had him encountering all these different adventures on an isolated island. But that night I was running out of things for Pete to do, so I just asked what they would do." His two daughters came up with different paths for the story to take and Packard thought up an ending for each of the paths. "What really struck me was the natural enthusiasm they had for the idea. And I thought: 'Could I write this down?'" Packard soon developed this basic premise into a manuscript titled The Adventures of You on Sugar Cane Island. He set out in 1970 to find a publisher but was rejected by nine publishing companies, causing him to shelve the idea. In 1975, he was able to convince Ray Montgomery, co-owner of Vermont Crossroads Press, to publish the book and it sold 8,000 copies, a large amount for a small local publishing house. The series was later marketed to Pocket Books, where it also sold well, but Montgomery believed that it would sell better if a bigger publisher could be found. After some discussion, Montgomery was able to make a contract for the series with Bantam Books. Packard and Montgomery were selected to write books for the series, including the contracting out of titles to additional authors. 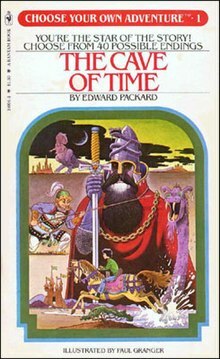 The famous phrase “Choose Your Own Adventure” was born when Ed Packard sold his second and third books. The second, Deadwood City, was a Western saga, and junior editor Dinah Stevenson was given the assignment to create a jacket line that would explain this unfamiliar narrative style to readers; Stevenson came up with “Choose your own adventure in the Wild West.” The phrase was adapted for the next title with the tag line, The Third Planet from Altair: Choose your own adventure in outer space. The series was highly successful after it began printing with Bantam Books. It prompted the creation of three other series by authors with Bantam Books that worked with the same format. Nineteen other series of the same format began being published by rival publishing houses. The large popularity of the concept led to the titling of a new genre of writing for the format, which was called gamebooks. ^ a b Scott Kraft (October 10, 1981). "He Chose His Own Adventure". The Day. Retrieved March 15, 2011. ^ Lodge, Sally (18 Jan 2007). "Chooseco Embarks on Its Own Adventure". Publishers Weekly. Archived from the original on 2007-10-09. Retrieved 2008-07-10. ^ Conan, Neal. "'Choose Your Own Adventure' Gets An iMakeover". NPR News Transcripts. NPR. Retrieved 29 December 2012. ^ Chmielewski, Dawn (11 January 2019). "Netflix's 'Black Mirror: Bandersnatch' Sued Over Use Of "Choose Your Own Adventure"". Deadline Hollywood. Retrieved 11 January 2019. ^ Gardner, Eriq (11 January 2019). "Netflix's 'Black Mirror: Bandersnatch' Leads to "Choose Your Own Adventure" Trademark Lawsuit". The Hollywood Reporter. Retrieved 11 January 2019. ^ a b Hendrix, Grady. "Choose Your Own Adventure How The Cave of Time taught us to love interactive entertainment". Slate. Retrieved 29 December 2012. ^ a b Katz, Demian. "Demian's Gamebook Web Page". Retrieved 29 December 2012. ^ Swinehart, Christian. "One Book, Many Readings". Retrieved 29 December 2012. ^ a b Sandi Scaffetti (March 30, 1986). "Interactive fiction". The Beaver County Times. Retrieved March 15, 2011. ^ Stevenson, Dinah, in discussion with the article editor, March 16, 2018. This page was last edited on 19 March 2019, at 01:57 (UTC).